Visitors to Toni-Lee Sangastiano's Burlington studio might be surprised to learn that all of the artwork there is hers. The range of mediums and visual languages on display is unusually wide: experiments in moiré marbling on paper, photographs of consumer items placed in empty religious niches in Italy, paintings depicting circus acts and boardwalk games, Academy-style drawings of nudes. On Sangastiano's business cards, painted canvas banners depict historically accurate sideshows: the bearded lady, conjoined twins and the like. A small side room holds an installation in an entirely different mode that Sangastiano did for the 2015 South End Art Hop. It consists of text painted on large, dangling sheets of clear plastic, through which more text from a website is projected on the wall behind. Called "You See Me," the work is about being a victim of stalking. Creating it was part of Sangastiano's healing process while enduring a years-long and still-active stalker. Originally from New Jersey, Sangastiano majored in art and graphic design at Fairleigh Dickinson University in Teaneck. 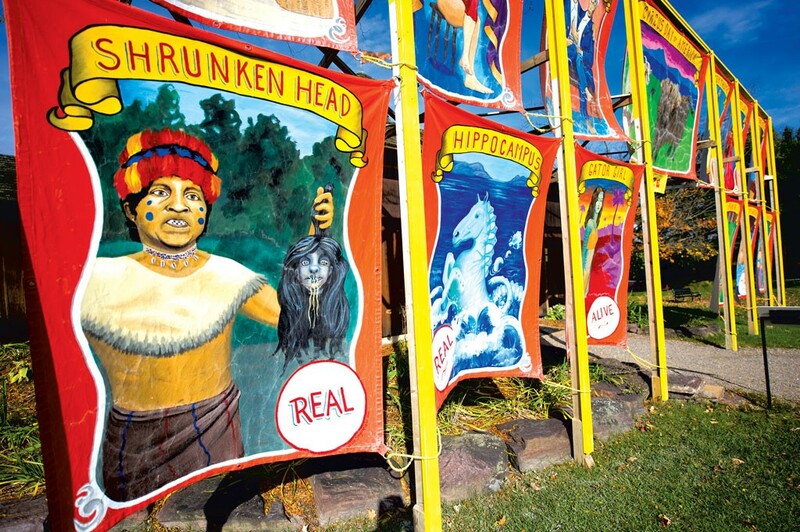 There she began painting banners for a teacher who had a sideshow business on Coney Island. After graduating, Sangastiano worked in the corporate design world for eight years. "Coca-Cola & the Feminine Ideal"
Now 42, the South Burlington resident has taught graphic design at Champlain College for the past 10 years while developing her art. She spent her sabbatical year, 2013-14, in Italy and other points abroad, studying classical drawing at the Angel Academy of Art in Florence and pursuing a doctorate in aesthetics and art theory through the Institute for Doctoral Studies in the Visual Arts. This summer she'll take her oral exams, then begin a dissertation that will draw on the theoretical work of Russian critic Mikhail Bakhtin. Seven Days spoke with Sangastiano about her varied work and its recurring images of sideshows, consumerism and the carnivalesque. Why do you need a PhD? I don't; it's a bonus for me. It was a case of discovering the theoretical basis of the things I was already doing. Bakhtin is about the unfinalizability of language, the carnivalesque, overturning hierarchies. I thought, Oh, my God, this is what has been in my work the entire time, and I didn't know it. Why is your work so varied? I don't like having one official language in art. That's also in Bakhtin. Because of the multiple meanings of language, we do not ever fully understand each other, but that also keeps the conversation going. Neither person is dominant. [Take] my paintings of boardwalk games. 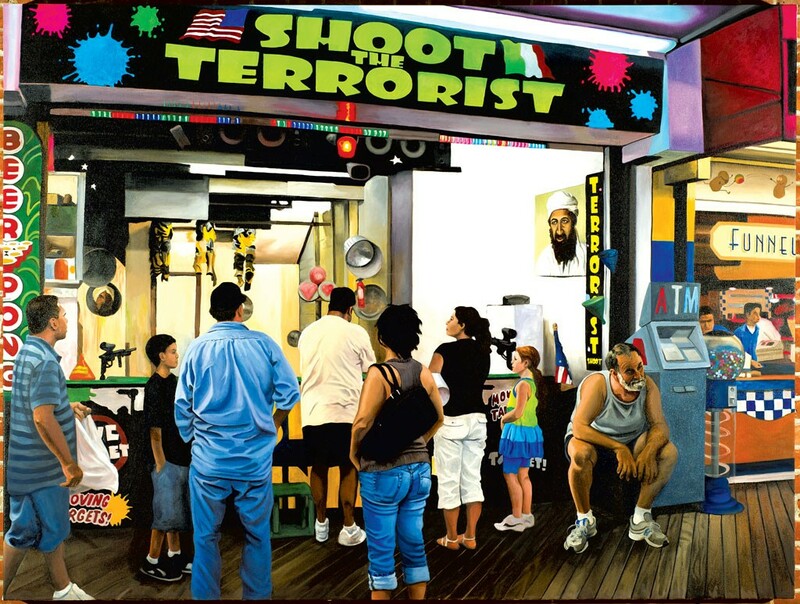 [These include actual pre-Hurricane Sandy games on the Jersey Shore, which Sangastiano photographed, called "Shoot the Terrorist" and "Shoot the Guido."] We live in a society in which we can actually have a carnival stand like that, but it's also a release in some ways, a reversal of hierarchies in the carnivalesque sense. The absurdity winds up being brought to the forefront. It's a reflection of society and where we are in the world. 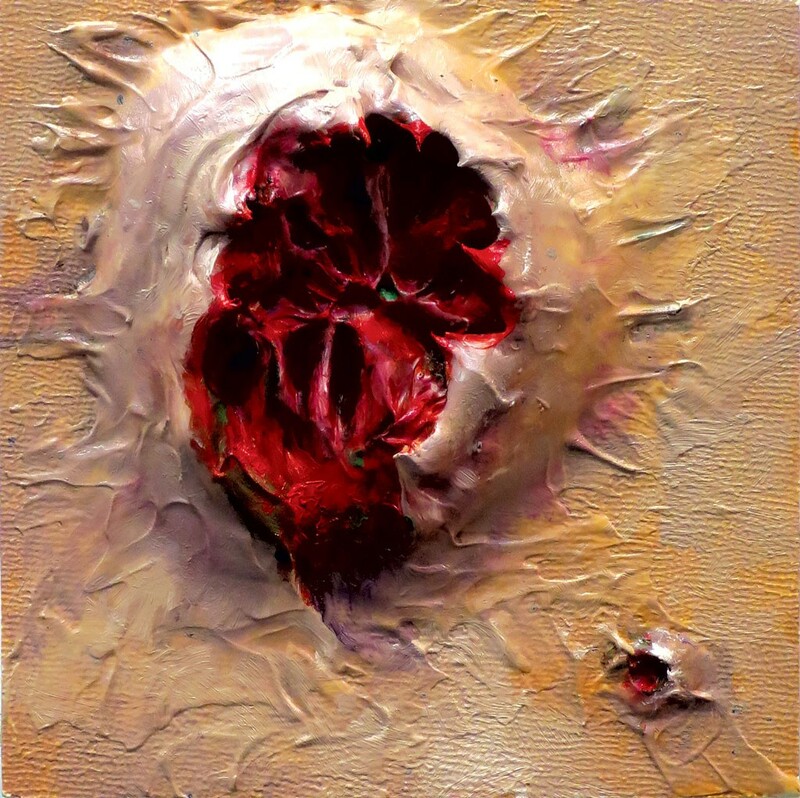 Why do you create realistic paintings from the photos you take? Why not just let the photos make the point? It's the tactile experience of being immersed in that process, and it also gives me the luxury of switching out small details. It's my love of painting and drawing. I don't think I'm a very good photographer, either. But you used photography for your series of consumer items placed in disused religious-statuary niches. I think I wanted to really capture those moments in time. Usually I photograph, and then there's process; this was process, and then I photographed. I found the Coca-Cola can in a 99-euro store in Florence, and it had this sexualized Bratz doll image on it. I used a puncturing tool to trace the image, then lit the can from inside. 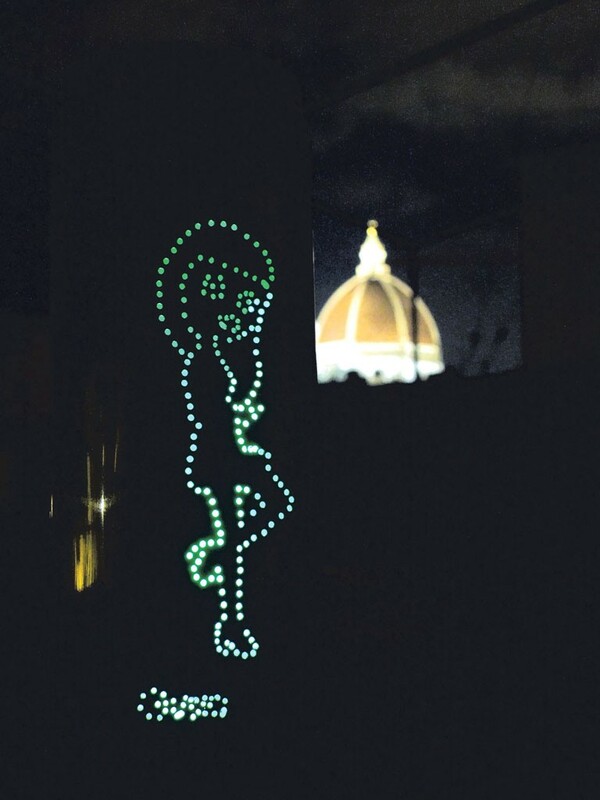 [In one photo, the can appears at night with Brunelleschi's Duomo in the background.] I was showing the shift from religion to consumerism. Also, I wanted to photograph it because it was very site-specific. I'm leaving [the object] there; I don't know what will happen to it. It will have a life of its own or not. What impact did studying the fundamentals of drawing for a year have on your art? It sped up my process by giving me a strong technical prowess. You learn anatomy, the bones and muscles that dictate line. It is really tedious — you're measuring with a string — but totally worth it. It's systematic; it takes the guesswork out of it. Even in setting up your palette, there's a very systematic way of getting the colors. I'm not saying that using guesswork to set up your palette is less valid. That's just another way. I can see going in either direction depending on your mood. You see yourself as a stalking "survivor," as if you've survived something that's over, but the harassment continues. Yes, I finally got a restraining order issued in May, and it was violated in August. Surviving is a process. It shifts regularly, daily. It's not like you get to a certain end point. Some days are easier than others. But I'm no longer afraid to use my voice to speak out. Being able to make art about it is part of surviving and thriving. You have a sideshow-banners business with a website. "Shoot the Terrorist (a.k.a. I'm Not Making This Up)"
Yes, I have to start cutting back on that work. I have a regular client in Texas who has a huge Halloween party every year. I make 4-by-4-foot devious banners for him based on photos he sends me. This year it's a close-up of his face being unzipped [rendered in makeup]. It's terrifying. What is that silverpoint drawing? That is of a melted piece of Humvee embedded with rocks, which my husband brought back from combat in Iraq. [She lifts up the original, 8-inch-long hunk.] He was in the National Guard. He told me a hand grenade caused it, and a soldier lost his hand in the incident. Later, I'm going to bring it to the Champlain College MakerLab and see if I can 3D scan it and print it in a bigger form — maybe even big enough to walk under. The original print version of this article was headlined "Beyond the Sideshow"